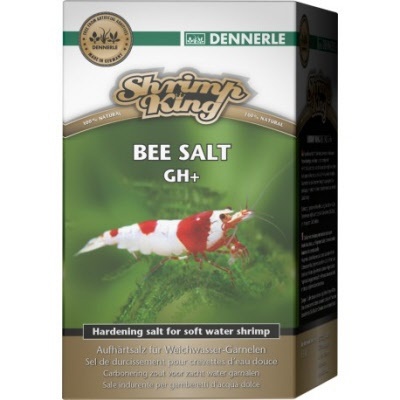 For targeted hardening of osmosis water, rain water, and distilled water, Dennerle Shrimp King Bee Salt GH+ is the perfect addition to your shrimp tank. This salt was developed especially for keeping and breeding shrimps from soft-water habitats such as bee and bumble bee shrimps. Includes all important minerals, trace elements and vitamins the shrimp require for healthy, even growth, brilliant colors, and reproduction. Bee Salt increases the total hardness, but not the carbonate hardness, creating a habitat that is appropriate for soft water shrimp. At the same time Bee Salt assists the performance of the filter bacteria. Aquatic plants also benefit from Bee Salt. It is speedily applied and promptly soluble.